Set for completion this fall, the six-storey (plus mechanical penthouse), 29.25-m (96-ft) high structure will showcase British Columbia’s growing expertise in the design and construction of large-scale wood buildings. 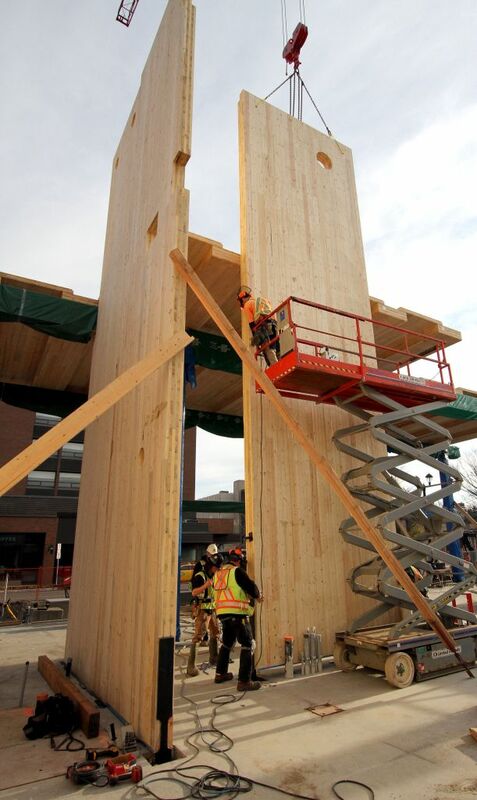 This project incorporates a unique structural system that uses a wide range of locally manufactured engineered wood products, and is targeting Gold under the Canada Green Building Council’s (CaGBC’s) Leadership in Energy and Environmental Design (LEED) program. The 4600-m2 (49,500-sf) building will be almost as tall as B.C. forests, and will be made up of 1846 m3 (65,190 cf) of various wood and engineered wood materials. fourth through sixth floors: commercial tenants. The provincial government has invested $25.1 million in the WIDC, creating an estimated 250 jobs during the life of the project. Nurturing new markets for the products made by the 19,000 British Columbians in the forest industry and 30,000 in wood products manufacturing is considered a priority. The choice of products used to build, renovate, and operate structures also has significant environmental effects. When specifying any materials, it is important to consider their impacts over the lifecycle. Wood products have less embodied energy, are responsible for lower air and water pollution, and have a lighter carbon footprint than other commonly used building materials. With growing pressure to reduce the carbon footprint of the built environment, building designers are increasingly being called on to balance functionality and cost objectives with reduced environmental impact. Wood can help to achieve that balance. There is also growing evidence exposed wood has positive impacts on the health and performance of occupants. A recent study at the University of British Columbia (UBC) and FPInnovations has established a link between wood and human health.2 In the study, the presence of visual wood surfaces in a room lowered sympathetic nervous system (SNS) activation, which is responsible for physiological stress responses in humans. This result opens the door to myriad stress-related health benefits that the presence of wood may afford in the built environment. I’m interested in elevator shaft details using CLT in particular how an elevator’s running rails are fixed in a wooden shaft and how fire treatment is performed.